Arsenic contamination in groundwater is a severe global problem, most notably in Southeast Asia where millions suffer from acute and chronic arsenic poisoning. Removing arsenic from groundwater in impoverished rural or urban areas without electricity and with no manufacturing infrastructure remains a significant challenge. Magnetite nanocrystals have proven to be useful in arsenic remediation and could feasibly be synthesized by a thermal decomposition method that employs refluxing of FeOOH and oleic acid in 1-octadecene in a laboratory setup. 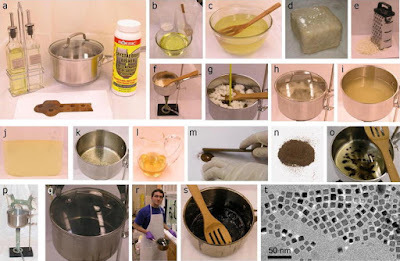 To reduce the initial cost of production, $US 2600/kg, and make this nanomaterial widely available, we suggest that inexpensive and accessible “everyday” chemicals be used. Here we show that it is possible to create functional and high-quality nanocrystals using methods appropriate for manufacturing in diverse and minimal infrastructure, even those without electricity. We suggest that the transfer of this knowledge is best achieved using an open source concept.